In both pictures, the one on the left is the Cammo/Pink and the one on the right is the Black/Pink. 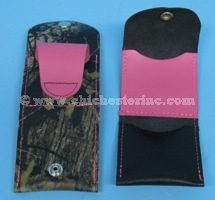 The leather ammo case with pouches come in two colors: black/pink and cammo/pink. They are approximately 3.5" long, 3.25" wide, and weigh 0.1 lbs.